599 Fashion is a fashion website selling men's, women's, and infant clothing and accessories for only $5.99 or less! This is amazingly well priced and on their website they show what every item retails at and then their price is always 5.99 or under! I was hesitant at first but after receiving my items I was more than impressed with the products. They are department store quality and you would never guess they were so well priced. 599 fashion has clothes for everyone and is a great place to order from, but I must warn you their items sell out fast so you have to purchase them quickly! 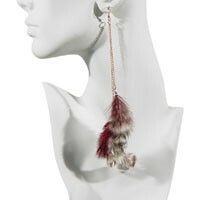 They carry many feather earrings that are awesome looking (not to mention a huge trend going around) and on 599 fashion they are priced for 1.99! You can choose between metal or silver and the brown feathers drop from the middle circle piece. They're super light weight and go great with any outfit. They are a mix between a natural and feminine look and are a great accessory to have! This off white semi see through lacy cardigan looks great over a white cami tank top. I love how the edges are loose and trimmed with lace, but the long sleeves are fitted. The middle ties together with a string slimming the waste and the shirt hits just above the thigh. The cardigan itself is feminine and chic looking and is only priced at $5.99. A price and quality you cannot beat! This would be a great place to purchase clothing and accessories for New Years parties. You can learn more about 599 Fashion and see the latest updates on sale info on their Facebook and Twitter pages.